James Hellyer - a blogger for DD - authors the final (2,000 word) Hustings Report. I formally thank all of the volunteer reporters who have, by their sterling work, contributed to ConservativeHome's campaign for a more transparent and democratic Conservative Party. The final hustings meeting took place in the less than salubrious environment of Exeter’s Livestock market. I’m not sure who selected an outdoor covered area for a night time meeting in late December, where a large contingent of elderly people were expected to attend, but they won’t be winning any prizes from Age Concern. The cold was widely noted, with even David Cameron joking that he’d lost feeling in his toes by the end of the evening! This little bit of local colour aside, the rest of the hustings would have been eerily familiar to anyone who had read even one of the previous reports filed on this site. As at the earlier meetings, there seem to have been rather more David Davis supporters handing out leaflets than there were supporters doing likewise for the Cameron campaign – although this may be attributable to the cold finishing off the t-shirt clad Cameroons. Everything else also seemed present and correct: David Cameron joking that the two Davids has spent so much time together they were thinking of entering a civil partnership; David Davis joking that after all this exposure together “Hello” magazine wanted a joint interview; Cameron boasting that he’d “really had Paxman”; and William Aitken sporting a “Modern Conservatives” t-shirt. The sense of déjà vu didn’t dissipate as the night wore one. Davis’s speech was the best platform performance I’d seen him give, while Cameron seemed typically fluent. However, every substantive point of both man’s speech has already been amply covered. In summary, Davis made a plea for substance over image, conviction based politics and fighting the government and thus help speed its end. David Cameron offered the familiar platitudes about change, optimism and hope, as well as the need to reflect the country we want to govern. The key difference between the two was Cameron’s belief that we should support government bills we agree with, and Davis’s belief that we should not back bad bills, and that we should instead hasten Blair’s end. Cllr John Jenkins, Deputy Chairman of Carmarthen West and South Pembrokeshire Conservative Association, authors this report from the Welsh Hustings. 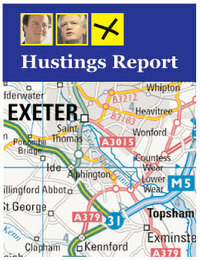 Later today, James Hellyer will submit the final report - for the Exeter meeting. The Celtic Manor Hotel in Newport played host to the penultimate hustings of the seemingly never-ending Conservative leadership contest. Both candidates were quick to deploy the racing metaphor of 'entering the final straight' and, predictably, trotted out the tried and tested lines that both candidates were seeing more of each other then their respective wives, cue David Cameron's civic partnership joke, met with groans rather than laughs, suggesting the assembled masses of the Welsh Conservative Party had heard it before somewhere. To say that the two Davids came to Wales to 'slug it out' would be rather disingenuous as at times the event seemed to be more of a love-in than a battle to the bitter end, all-or-nothing, death-or-glory which the soothsayers in the media predicted such a contest would be. I lost count the number of times the two Davids said they agreed with each other and the amount of times they both - although Cameron said it most - that there was more that unites the two candidates than divides them. Sam Coates, author of the Votes at 18 blogspot, submits the ninth Hustings Report (and, I think, the most comprehensive) - for last night's gathering in Westminster (Methodist) Central Hall. Sam will be a member of the panel of undecided Tory voters on this afternoon's Sky News Leadership Debate (3pm, repeated 9pm). If he looks at bit tired on that programme it will be because he submitted his report at 3.17am this morning. I call that dedication! 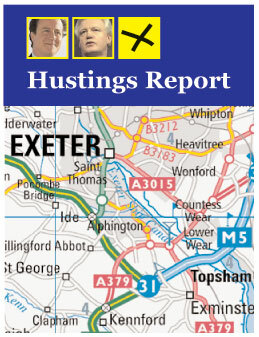 The final two hustings - in Exeter and Newport - will be reported on next week. Firstly, an apology to the two leadership campaigns… us ConHome hustings reporters must be very annoying to them! I won’t lose sleep though - the scripts are still unchanged. The London hustings was always going to be the most influential one, and I did feel both candidates were slightly nervous. 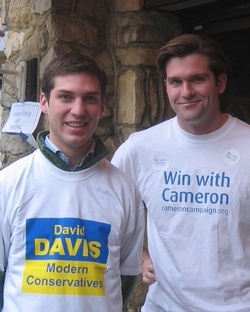 There were a lot of supporters with stickers and flyers – the Davis campaign had a fair showing but couldn’t match that of the youthful Cameron campaign. By the main stairwell it was at least equalled by volunteer leafletters for this very website, “run by the members for the members”. The setting was the Great Hall in Methodist Central Hall; it was roughly 90% full out of a maximum capacity of 2,160. A magnificent but echoey building, the subsequent sound problems showed some of the Tory brigade to be quite rowdy with their “can’t hear you” cries. Oddly, the cries came back briefly around the time that the Chairman of the proceedings (London regional Chairman, Matthew Carrington) was asking for money to cover costs! I wasn’t the only one to note the relatively high proportion of young people in the audience. Lakeside International, home of darts, hosted the 8th hustings. It turned out to be a very good humoured event, with even the car park providing comedy moments as 600 over 70’s parked their Rovers. The support teams for both camps were well organized, although the Davis team had more goodies to give out. The opening statements from each candidate were very similar to what’s been reported from previous hustings. David Cameron opened up exactly on-time with his trademark relaxed style and stage-roving command of the room. He told us an amusing anecdote about how, on this very spot, Eric Bristow conquered the world at 23. Having reminded us that youth won, ‘conquering’ lead neatly into the Paxman interview, which got a huge cheer. Then came the dreaded civil partnership joke and a good laugh, but definite pained looks from hustings staff. David Cameron went on to tell us that Labour isn’t frightened of the party that it’s already beaten three times: we need to change; for example we need caring policies on childcare and the environment :- issues that are vital to many people, but fringe to the party. David Cameron claimed the judgement to know when to stand up to New Labour and when to support them for the good of the country. Lakeside Leisure Complex describes itself as the Home Of World Darts, the hallowed spot where the legendary Jocky once slugged it out in beery combat against the mighty Cockney. No beer (or Pink Pussies) on hand today, but still plenty of well-flighted arrows. There was an excellent turnout of about a thousand, and not all of them over 65 (or even 67). Plenty of support for both Davids, although quite a number chose to wear stickers for both sides, so we guess there were still many undecideds. The atmosphere throughout was relaxed and upbeat. DC was first up to the ockie. He delivered his usual polished noteless performance, complete with jokes about people like Alexander the Great and Eric Bristow achieving huge things even younger than him. In truth, we'd heard most of the jokes before ("having" Paxman, seeing more of DD than his own wife - maybe they should get a civil partnership, etc), and it may be time for a new script. But his familiar slogan "Hope Optimism Change" did seem to go down well in the hall. This is the second of two reports from last night's Cambridge Hustings. Gary Weller has filed already. 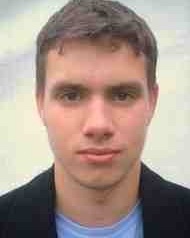 This latest report comes from Jamie Martin. Jamie is a 21 year old Cambridge student. He lives in North London and has worked for the Conservative Party in his GAP year and in the Research Department while at university. The seventh hustings in the final stage of the Conservative Party leadership contest were held at Chilford Hall, Linton, Cambridgeshire. The venue, a grand institution, with an illustrious history and links with Britain’s past, had also, judging by the hall in which the hustings were held, recently been modernised to be truly up to date with and functional for the twenty-first century. The omens were, from the very off, clear. We were, across the evening, presented with two competent but contrasting performances. Davis was confident, bullish in his language of attack against New Labour, but stark in his defence of the party’s core principles; “kill these, and you kill the Conservative Party” he reminded the audience. Cameron, who once more used his advantage of not being anchored to a dispatch box, advocated his two unique selling points excellently. That he is a young, vibrant and fresh leader with a charisma which can reach far and wide outside of Chilford hall, and that he presents a potential answer to the party’s ideological struggle of the past thirty years. No longer must we choose between a pragmatic left or ideological, radical right; Cameron offers radical solutions which will deliver moderate, compassionate Conservative answers. The Conservative hustings in Cambridge was held at Chilford Hall in Linton, an enchanting but very remote venue. It was a cold and fresh evening, but not cold enough to freeze out fresh speeches and encouraging performances from Messrs Cameron and Davis. Davis was first to speak, and used his speech to confirm his intentions to reduce taxes and “attack” Blair, should he become leader. A staggering £38 billion in tax cuts were promised by Davis, which went down quite well with the audience, but perhaps not as well as one might have expected given the nature of the audience. This perhaps suggests that even the party faithful are beginning to become wary of such promises. A large portion of Davis’ speech was focused on the apparent need to attack Blair, and he used his speech to boast how he had helped to remove both David Blunkett and Beverly Hughes from office. Davis concluded by explaining that the country can choose to blindly follow Blair, or choose the “battle hardened experience” of the Conservatives. During open questions, both candidates agreed that Devolution needs to work, and Scottish MPs should not vote on English only matters. Both also agreed that the police should not be armed as a matter of course, but should be given a bullet-proof vest. On the issue of future energy needs, both, again, agreed that nuclear power should be seriously considered, Cameron branded windmills as 'giant bird blenders' and that biofuel, on the other hand, was a good idea for both farmers and the environment. Davis will abandon tuition fees, Cameron will not. Davis (perhaps rashly) threw in an ace on a question about the Regiments, by pledging to reinstate them to their status before Labour took power. This brought the roof down, as the local Black Watch Regiment has recently been axed; whilst serving in Iraq. David Cameron on the other hand sounded doubtful that this could be achieved but supported the aspiration. On the question of why people hold politicians in such low esteem, David Davis said there were three reasons, 1. Mandelson 2. Byers and 3. Blunkett. He also wants to take away from the Prime Minister the power to rule on the ministerial code and instead defer power of judgement to the Privy Council. David Cameron reminded everyone that before Tony Blair came to power he was promising 'whiter than white politics', yet the reality was very different. When the issue of transatlantic relations came up, David Davis launched an unexpectedly scathing attack on Tony Blair, saying that he was dazzled by the White House and because of this had neglected Britains national interest. As a lifelong Manchester United fan (and yes, before you ask, I am from Manchester) it is often tempting to aim some polite jibes at Bolton Wanderers and their Reebok stadium, the hosts for Wednesday’s solitary hustings. Perhaps similar questions can be asked of the Trotters and our leadership contenders – are they the finished article, or merely the plucky underdogs gamely fighting above their level? 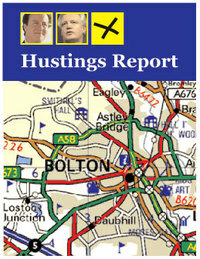 The fifth Hustings Report is from Adrian Owens. Adrian kindly stepped into the breach only an hour or so ago. The volunteer reporter I had expected to file has gone AWOL (at least so far) and noticing Adrian mentioning tonight's meeting on another thread... I asked him for a report. So: "Thank you Adrian!" "Hundreds of activists descended on the Premier Suite at Bolton Wanderers as the temperatures plunged below zero. The venue was recently used for Amir Khan’s latest fight, but there were no killer punches landed tonight, in an event that will have changed few minds and left the undecided well…. still undecided. The format appears to have followed those of earlier hustings. Each candidate spoke for 10 minutes. There then followed 12 questions selected from written submissions made by the audience when they entered the hall. Finally, each candidate summed up for 3 minutes. David Cameron raised the most laughs. A joke about Old Labour dinosaurs was particularly well received, though the joke about civil partnerships is starting to wear a little thin, or perhaps it was always likely to be less well-received in the traditional north.